Once Halloween passes, it seems like everyone just wants to start decorating for Christmas. We aren’t saying that’s necessarily a bad thing, but what about Thanksgiving? There is plenty of time to decorate for Thanksgiving between Halloween and Christmas, especially if you have some decorations left over from Halloween. This year, we’ve come up with a few décor tips that will make you want to go all out on decorating for Thanksgiving this year! What are you thankful for? Why not tell everyone using a message board! A messaging board is an easy DIY project that you can make simply by using a foam core and an old frame. When guests arrive for Thanksgiving dinner, have them write down what they are thankful for this year on a pre-cut leaf made out of paper and pin it up on the message board. This is both a fun activity to do with your loved ones and a perfect Thanksgiving decoration! Plus, it will serve as a great reminder of all that you have to be grateful for. If this doesn’t make you want to decorate your home for Thanksgiving, then we don’t know what will! Besides being thankful for all that you have, what’s the first thing that comes to mind when you think of Thanksgiving? Food, of course! An entire dessert presentation of caramel apples, pies and cookies is the perfect way to wow your guests this holiday. Just thinking about it makes our mouths water! Let’s get a little creative! Grab a pumpkin and some paint and you have fun, easy DIY project in front of you. Even better, if you already decorated your home for Halloween, then you probably still have pumpkins lying around on your front porch or somewhere around your home. The great thing about this DIY project is that you have complete control over how you want to decorate your pumpkin. Maybe paint your pumpkin white and add a gold “Give Thanks” on it, or throw on some festive gold glitter to create a gorgeous centerpiece. It’s completely up to you – you have a blank canvas in your hands! What easier way to decorate your home than by adding a few throw pillows around the house? Sticking with fall colors like shades of orange, purple, mustard, gray and brown make for the perfect seasonal decoration. If you want to get a little more festive, purchase some throw pillows that are specifically related to Thanksgiving. Don’t skip out on decorating your home this Thanksgiving. Thanksgiving is the time to celebrate what you’re thankful for with the ones you love, so it certainly deserves some recognition! 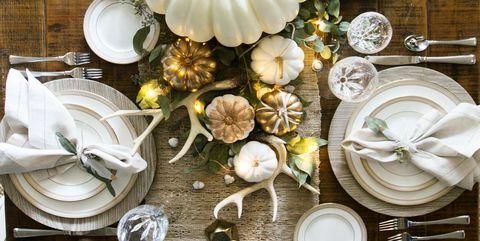 We know the end of Halloween means Christmas is right around the corner, but this year take a step back and welcome Thanksgiving decorations into your home. We have no doubt that these décor tips will get you even more excited for this year’s holiday feast!